Samlor kako, a.k.a. Cambodian ratatouille, at Queen’s Deli. It’s been more than five years since my last meal at Queen’s Deli in White Center, and little has changed inside the restaurant. The tables are still empty. A large ATM machine appears unusable, dominating space but failing to dole out dollars needed at a cash-only restaurant. The glass windows of the steamer table are fogged up, obscuring the items inside. In front of it sits a selection of items wrapped in banana leaves, secrets safe inside. Off to one side, tables are full of bagged items which I’d later learn are rice cakes to take to temple for the upcoming Cambodian New Year celebration. There’s no host, as expected in such a place. Making my way to a cash register, I see a handful of menus, so I take one. It’s well-used, but a quick check of my notes reveals that the menu has been updated since my last visit, with some prices understandably a dollar or two higher than before. I head to a table to peruse the new menu while waiting for a friend. I’m not especially familiar with Cambodian cuisine, though I note the influences from neighboring countries. The steamer table sports a curry, perhaps coming from India. Some vegetable and noodle dishes look like they might have origins in China. In the soups and stir-fries, I see signs of Thailand, Vietnam, and Laos, especially evidenced by the variety of vegetables and fresh herbs. Num Banh Chuk at Queen’s Deli. When I finally get service, it’s friendly. A man who’s probably managing the whole place himself steers me to some typical Cambodian dishes. But when it comes time to order, he’s gone—until a group of six women come in to get donuts. They head off, presumably to the grocery store next door, as their order will take a while. Finally, my dining companion decided to come up to the counter to place our order. This, too, is typical of these types of restaurants. After some time, the first item that comes to the table are two beef skewers served with pickled vegetables. As we didn’t order it, this seems to be a gesture of appreciation for our patience and presence, and I enjoy the notes of lemongrass on the grilled beef. While no one else comes to dine my entire time in the restaurant, it still took about 40 minutes to get our first ordered dish – something to keep in mind when visiting. 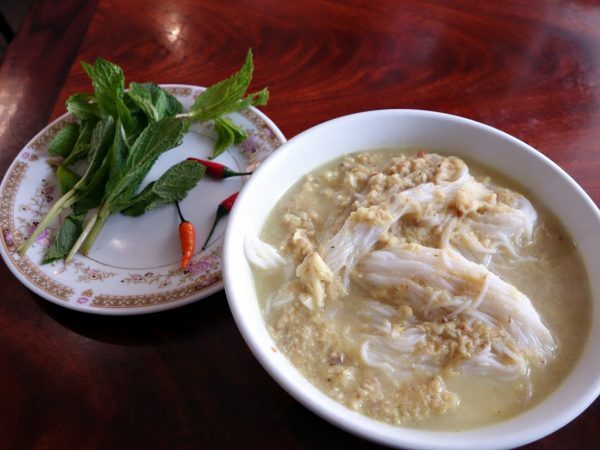 We enjoy num banh chuk, a traditional Khmer noodle soup made from ground lemongrass and other spices. Below the rice vermicelli noodles are banana blossoms, and while the lemongrass is the prevailing flavor, there’s a slight funkiness from prahok, a fermented fish paste made from mudfish. 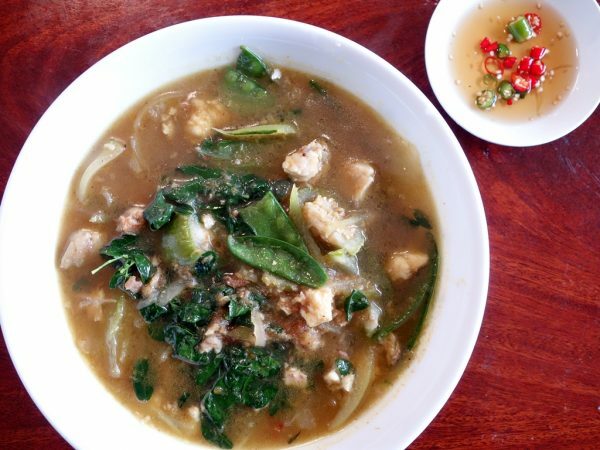 Next comes samlor kako, which the menu describes as “Cambodia ratatouille” that is “a very traditional and old [recipe].” It’s made with a choice of fish, chicken, or pork, though you can get it with vegetables only, including very pleasant pieces of pumpkin. The num banh chuk comes with a plate of mint leaves and chili peppers, while a chili-spiked fish sauce accompanies the samlor kako; this is typical of Cambodian food, in which condiments—especially chili peppers—come on the side to be used at the diner’s discretion. Bookending my meal are two small treats. 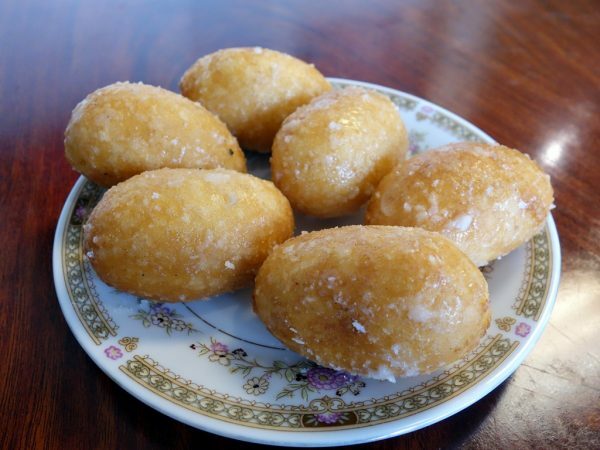 Nom krok are like the Cambodian version of Danish aebleskivers. These coconut-rice pancakes are made with rice flour batter and contain coconut, chives, and sugar. I dip one in a teuk trie of coconut milk-infused fish sauce and instantly burn my mouth, as the custard inside is a molten affair. At the end of the meal, I have to ask for a quick fry of nom pong n ‘song, better known as “lizard’s eggs.” These are egg-shaped donuts made from rice flour, with a yolk-like filling of mung bean puree that’s salty and spiked with chives. They’re coated with a sugary glaze and best eaten warm. I remind myself to think twice about coming to Queen’s Deli if I’m in a rush or looking for stellar service. What do you expect when the wait staff is also in the kitchen, cooking the food from scratch? On the other hand, considering the reasonable prices (the samlor kako was the most expensive dish, at $7.99), waiting is a small price to pay if you plan accordingly. Originally published at Ethnic Seattle on April 11, 2018. ← One Pot Serves Up Korean Stews in the I.D.